This is a truly exquisite fossil Nautilus necklace hand crafted from a Cretaceous Madagascan Nautilus slice strung from an 18 inch solid sterling silver curb chain. The Fossil Nautilus slice measures 2.5cm from top to Bottom. 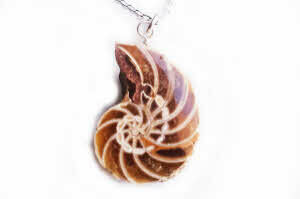 This is the VERY FIRST Fossil Nautilus necklace I have ever offered for sale - and I am sure it will be popular. The main difference is in shape of the shell with the Nautilus being a longer fatter shell. They are a lot more rare than the Ammonite and very rarely seen for sale in any form. I have created this necklace with new findings which means that EVERY part of the necklace apart from the Ammonite is now SOLID sterling silver. In the past I have used silver plated findings and a solid silver chain - but now it is ALL sterling silver! BOXED AND LABELLED - in a stunning black velvet lined jewellery box.